Visiting New York is all about going to Broadway shows, I think. My wife and I try to see at least one and sometimes two when we’re in town like we were in early June this year for my birthday. The theater district, like all of New York, has no end of choices for eating after a show and we’ve gone many places over the years. But one of our favorite things to do after a show is go New York old-school and have Nathan’s hot dogs for our late dinner. The original Natahan’s is in Coney Island, about six or seven blocks from where we lived while I was in high school and college. Its an hour-plus subway ride from Manhattan, but if you have the time, experience it, especially in summer when it’s packed with people. That way you can say you’ve done something real New Yorkers do. 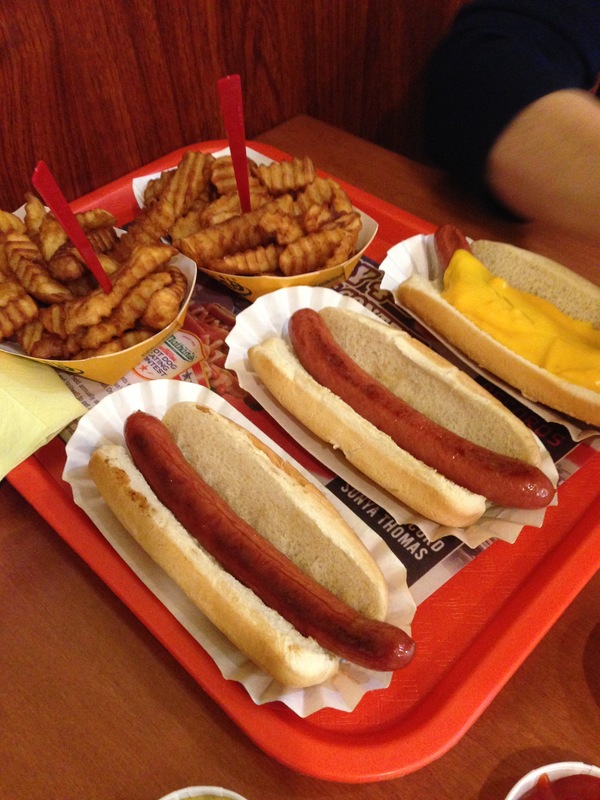 But if you’re seeing a show, there is a Nathan’s in a food court on Eighth Avenue between 44th and 45th street, right there among the theaters of Broadway. When I go off my post-angioplasty diet, I want it to be for amazing treats I love. Nathan’s hot dogs fit that bill. 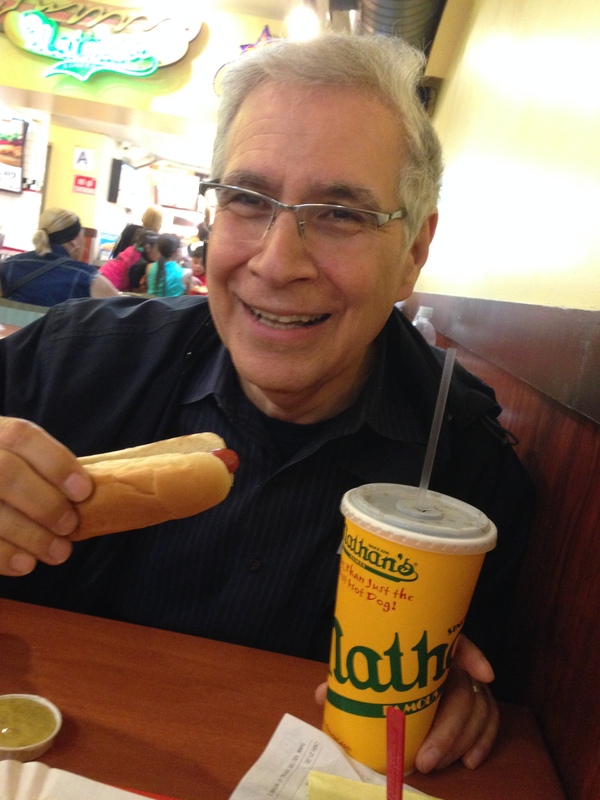 Nathan’s has hot dogs made from its own recipe and they do taste different from any other I’ve eaten over the years. It also serves a waffled fry that is rare and wonderful, holding ketchup like no other. The food court is a bit run-down, much like Times Square used to be. The food court has been cleaned up a bit since our last visit there in 2011, but it’s still hardly glamorous, looking more like the old Times Square than the new sanitized one. And for an old Brooklyn boy like me, that’s kinda fun to see. 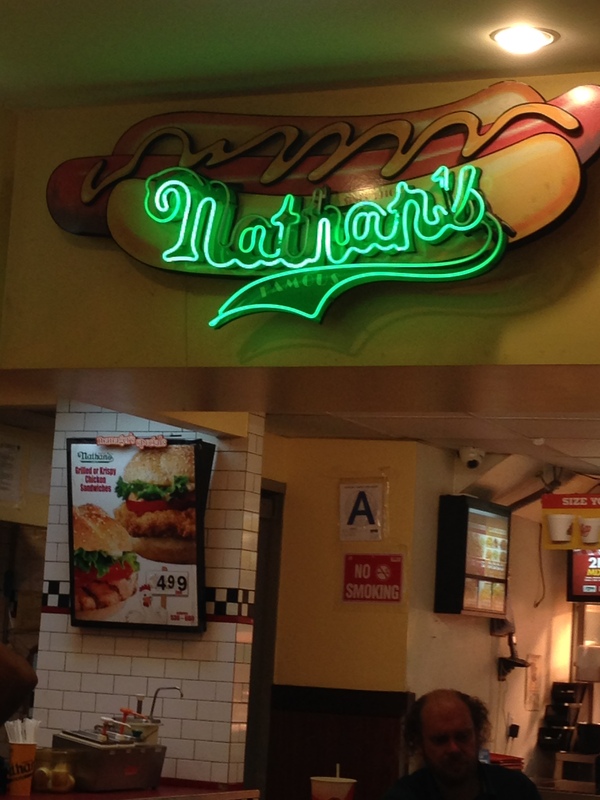 We sat there eating hot dogs close to midnight and I traveled back to my childhood a bit, an added bonus of Nathan’s. This was a diet splurge well worth the salt and fat for me. Grilling season is here — how about grilled salad?